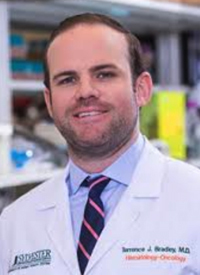 For patients with myelofibrosis (MF) and polycythemia vera (PV), symptom burden can take a toll on quality of life, explained Terrence J. Bradley, MD, an assistant professor at Sylvester Comprehensive Cancer Center, University of Miami Health System. However, there are approved and investigational agents that patients can turn to, added Bradley in a presentation during the 2019 OncLive® State of the Science Summit™ on Hematologic Malignancies. The frontline setting of myelofibrosis currently consists of hydroxyurea and ruxolitinib (Jakafi), said Bradley. With ruxolitinib, the phase III COMFORT-I trial was the first study to demonstrate a survival advantage in patients with MF. In the double-blind study, patients with intermediate-2 or high-risk disease (n = 309) were randomized to receive ruxolitinib or placebo. A reduction in spleen volume ≥35% as measured by CT or MRI served as the primary endpoint of the trial, with secondary endpoints of durability of response, symptom burden, and overall survival (OS). Though many patients experience blood count abnormalities and constitutional symptoms, enlarged spleens are a common cause of discomfort prompting the primary endpoint as such, said Bradley. Crossover to the ruxolitinib arm was permitted in the absence of response. At 5 years, 59.4% of patients initially randomized to ruxolitinib achieved ≥35% reduction in spleen volume with a median duration of response of 168.3 weeks.1 Moreover, patients who received ruxolitinib had an improved OS at 55.5% compared with 46.8% with placebo (HR, 0.69; 95% CI, 0.50-0.96; P = .025). However, the rate of OS in the ruxolitinib arm may be an underestimate as crossover was accounted for in the analysis, said Bradley. Subsequently, the COMFORT-II trial2 was designed to compare ruxolitinib with best available therapy, which consisted of hydroxyurea, steroids, and expectant management, said Bradley. The trial design and patient population were similar to COMFORT-I, with the caveat that patients (n = 219) were randomized 2:1 to ruxolitinib and best available therapy. At 5 years of follow-up, 53.4% of patients initially randomized to ruxolitinib achieved ≥35% reduction in spleen volume with a median duration of response of 3.2 years. Though a percentage of patients in both arms failed to attain a ≥35% reduction in spleen volume, a total of 97.1% of patients experienced some degree of clinical benefit following a reduction in spleen volume. The estimated rates of 5-year OS were 56% with ruxolitinib and 44% with best available therapy. As in the COMFORT-I trial, crossover may have dampened the benefit in OS in the analysis, said Bradley. Apart from ruxolitinib, which inhibits JAK1/2, and among the investigational JAK inhibitors––such as momelotinib and pacritinib––fedratinib, which is a highly selective JAK2 inhibitor, has shown the most promise, even among those with prior exposure to ruxolitinib. In March 2019, the FDA granted a priority review designation to a new drug application for the agent as a treatment for patients with myelofibrosis. Moreover, alisertib (MLN8237), a selective aurora kinase A inhibitor, was studied in patients (n = 24) with intermediate- or high-risk MF. Among those enrolled in the study,3 17 had post-MF, 4 had post-essential thrombocytopenia (ET), and 3 patients had post-PV MF––all of whom had palpable splenomegaly and transfusion dependence, said Bradley. Approximately one-third of patients with palpable splenomegaly ≥5 cm achieved a reduction in spleen volume, and 8% became transfusion independent. Notably, 23% experienced ≥50% reduction in the Myeloproliferative Neoplasm Symptom Assessment Form score. Moreover, the agent was well tolerated. “Cytopenias were the primary side effects as we see already with the approved therapies in these diseases,” said Bradley. Additionally, patients on study underwent serial bone marrow biopsy, which revealed that long-term responses were associated with a grade reduction in marrow fibrosis. Response to therapy was also linked to a decrease in the JAK2, MPL, and CALR-mutant allele burden. For patients with PV who are not receiving phlebotomy but require pharmacologic therapy, hydroxyurea can be given as a first-line therapy after which ruxolitinib can be given as a second-line treatment alongside anagrelide and interferon, said Bradley.